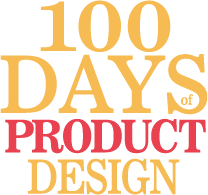 A user journey is a record of the steps the user takes (tasks) to achieve their goal with your product. It also shows how they’re feeling and what they’re thinking as they complete each task. User journeys are handy tool to find and fix user pain points, and to illuminate the steps a user must take in order to reach his goal (e.g. buy a quart of milk, find when a movie is playing, send an email). 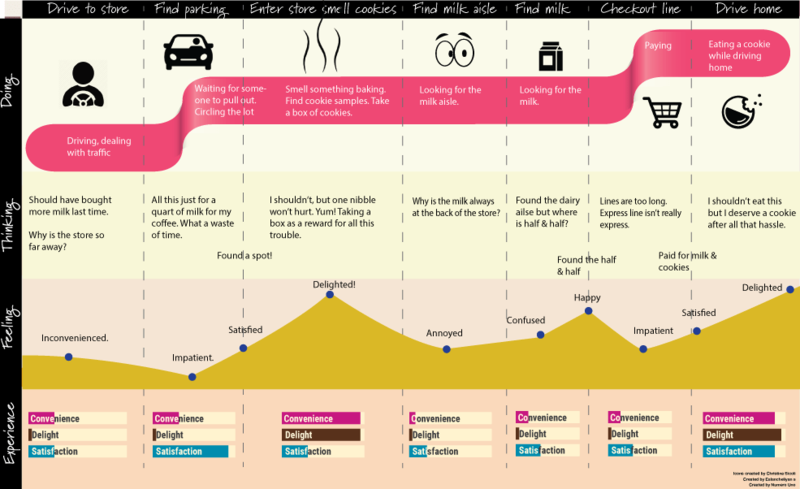 Mapping the journey uncovers complications, extra tasks you might have missed (like waiting for a parking spot when buying a quart of milk) and those precious moments of delight. They’re also mighty useful for demonstrating to stakeholders and the product team where users are suffering, getting lost, or dropping off the application. User journeys can go hand-in-hand with empathy maps. But where an empathy map shows thoughts and feelings in a single point in time, the user journey shows how those feelings change as the individual uses the product. getting back in the car and eating a cookie on the drive home (delighted). The columns are each step in the journey. Be as detailed as you need to show each change of emotion as the user progresses through her task list and finally reaches her goal. A really fancy journey map. Most just look like a table with rows and columns. The Experience row at the bottom is where you can show the three main experiences you hope your customer/user will have with your product. In this case, Convenience, Delight and Satisfaction. Then graph how closely you’ve achieved that at every step of their journey. As you can see, the two moments of delight have high Convenience and Delight, but only the last moment also had high Satisfaction. The advantage to a journey map is that you get a really good picture of how a user is feeling over time while using your product. Now you can easily identify where the pain points are and where in the user journey you need to make some improvements. Map your experience in the coffee shop (or any recent experience). Be as granular as possible. Create a table like the one above that shows your actions across the top and Doing, Thinking, Feeling and Experience down the side. This can be a simple as a whiteboard drawing, or elaborate as the infographic above. Create a pdf and share your journey map in the comments and/or on Dribbble and Twitter #100daysdesign.